Aujourd'hui, je vous presente mon blog. Je voulais creér un petit blog pour exprimer mon opinion. Mais, j'etais timide. Alors, je lisais le blog de Monsieur Amitabh Bachchan souvent et il m'a inspiré. Mon mari m'a encouragé pour creer le blog. Ma belle mere donnait un bon nom - Shaivi ka funda. ça fait trois ans que j'ecris le blog. Je m'exprime mieux grace à mon blog. J'ecris beaucoup de choses - les histoires, mes opinions de nouvel films, mes opinions de restaurants a Delhi, les travelogues, mes opinions de nouvelles romans etc. J'ai gagné beaucoup de prix pour mon blog. J'ai decouvré mon passion - écrire gracé à mon blog. Un jour, je veux écrire un roman aussi. Je vous invite à mon blog. N'oubliez pas le nom - Shaivikafunda.blogspot.com. Awaken the leader in you discusses the traits & skills needed to be a successful leader. This book destroys the myth that leaders are only people at the top management levels. Offering a completely new perspective on leadership, Mitesh & Indu categorize leaders as extraordinary people if they have an entrepreneur mindset and ordinary people if they have an employee mindset. The authors firmly believe that all are born with infinite potential and witness every ordinary person, there lies an extraordinary leader. 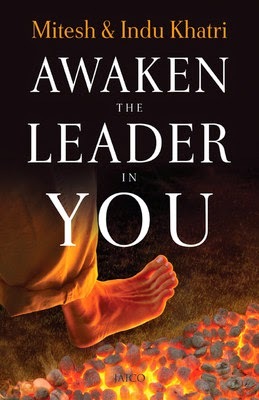 The tenact of this book is to awaken that leader in you. Replete with inspiring leadership stories, exercises and simple-to-apply strategies, this is a step-by-step guide for the spiritual individual to develop the entrepreneur mindset and become a leader in his professional as well as personal life. There was a time when I was heavily into self help books. Then slowly, I began discovering the same wisdom with a different garnish in most books. So, when I received this book, I was having my own set of doubts. However, the publisher too knew this about most readers, for one look at the cover was enough to awaken my curiosity - The foot on the burning coal. I flipped few pages and my curiosity got deeper – a corporate trainer who fire walks! Not just himself but along with his learners during the training sessions! Now this was different and I had to read the book to understand the author’s views. In the 11 chapters, Mitesh and Indu have made a decent attempt at sharing the tips for effective leadership. To prevent the book from becoming all preachy and boring, they have smartly incorporated various examples from corporate life, which I found very interesting. To kill the preconceived notions in the reader’s mind, the author actually begins the book by discussing why one should read the book when there are various others on the same topic donning shelved of bookstores. And from there, the reader starts to feel as if he is actually participating in a live training session! I especially liked the way they have shared how the difference between leaders and others lies between the “employee” and the “entrepreneur” mindset. It made me stop and ponder, for the principle holds true in all aspects of life. Also, the chapter on emotional intelligence has been beautifully done, with simple tips on how to manage our emotional patterns, for the person who has achieved a control on emotions has cleared a big hurdle in the path to professional success. The concept of trust bank accounts introduced by the author exposes reader to the advantage of building trust with people since the level of trust we create within our people is directly proportional to the effectiveness of our leadership effectiveness. After every chapter, there is a recap section, just in case, one wants to highlight future main points for future reference. Just like live training sessions, there are various exercises for the reader to take. The author has given a personalized touch by asking readers to mail their filled forms to take the exercise forward. There are various references to Youtube videos on leadership which one can see to have a deeper understanding of the topic. At some pages, it felt like I was reading an endorsement of the training programs, not a book, and in order to understand the tips for effective leadership, one would have to undergo a session by the authors. I would still recommend this as a very useful book for people who can’t afford the expensive leadership trainings, yet want to make that important transition from an employee to a leader. I have heard about his unique method of using fire walk activity in his sessions and am all eager to attend a session myself! Follow the exercises mentioned in the book and you will definitely feel more enlightened in your journey to effective leadership, once you would have flipped the last page. A big thanks to BecomeShakespeare.com for sending me the book for review. It has been few months since Mr. Hubby and I have been taking French lessons. What started as a mere hobby has now transformed into a passion. Also, we have discovered a rather new and romantic way of communication. It’s a pleasure to the tongue when words in French roll out of our mouths and friends and relatives regard in appreciation, often amused by our newly acquired skill. The journey so far has been far from easy – taking time out of our busy schedules, sacrificing our precious weekend getaways, going back to the classroom, answering a swarm of questions from friends and relatives (why do u people have this endless craving to learn something new? ), and most importantly, facing the exams…we have braved it all…and all I can say, so far it has been a soul enriching experience. Well, more about the journey later. For today, I want to extend my French affair to my blog. I discovered a new passion when I began blogging and today, my knowledge of French has given new wings to my blog-experience. Je t’aime means I love you. When I closed my eyes and thought about my love for French, these are the only words my heart shouted; for its not just the language I have fallen in love with….various hues of the culture have also charmed me. So, on this tab, I intend to write in French, about French and for my friends who share my passion for French language…. A good person is one who stays connected to his roots; who remembers the bonds of love; and who values the relationships that helped him in the journey called life. One of the earliest bonds we have in life is with nature. For its nature that becomes our first school. 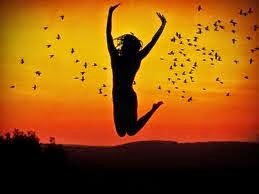 As we grow up, we take the highway to success and often ignore the bond with nature. But nature takes it all with a smile, our love and even our mistakes, for nature is the mother, and a mother is always showering love and care on her children. It was mom who strengthened my bond with nature. My earliest school was my garden, where I got my first lessons on colors and names. Nursery admission interviews were around the corner. Ma would take me to the garden, ask me to name the vegetables, fruits etc and tell the color. We would look at the lovely squirrels and sparrows on the guava tree and I would name every bird I saw. The leaves taught me green, the marigold-yellow, the tomatoes –red, the roses – pink. Although I cleared the admission process with flying colors, our morning rendezvous in the garden continued where ma and I sat every morning, listening to the chirping of birds and soaking in the beauty of nature. Coping up with the fast lane life, we somehow drift apart from nature. It is only when we see someone caring for nature that we remember our own bond. 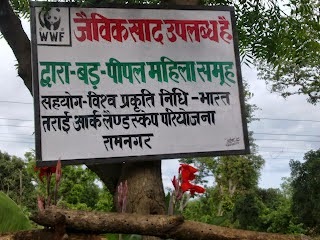 Recently, I was on a visit to Corbett with Mr. Hubby when I saw a WWF project signboard near the entrance. On asking the locals, I was told the local women partner with WWF for a project wherein they make natural manure from earthworms. We all had read in textbooks about compost and natural manures and conveniently forgotten it to the comfort of chemicals. But these villagers had kept their bond with nature intact. When I expressed my desire to see how the manure was made, the ladies were excited to see the madam from Delhi taking interest in their project. Like a chief guest, they welcomed me into their huts and showed me the pits covered with hay where natural manure was made from earthworms. “Memsaab, these earthworms are like our children, we care for them and Mother Nature cares for us…” their words inspired me so much that I pleaded to adopt some of the earthworms to take back home and bought their amazing natural manure. The earthworms are our family members in the garden where mummy feeds them vegetable waste and they give us natural manure. When a child befriends the wrong person, the mother gets worried in concern. A big concern for nature today is mankind’s friendship with plastics. Plastics look presentable and convenient, but they pose threat to Mother Nature. Being non biodegradable, it is next to impossible to dispose them completely without harming the environment. While people in metropolitans still ask vegetable waallas to pack the veggies in polythene bags, the stand taken by people of Himachal Pradesh impressed me a lot. On a recent visit to Himachal, I found out that plastic bags are banned there and people use paper or cloth bags to carry their daily needs. “When they can, why cant we?” I wondered and once home, Mr. Hubby and I thought how we could get rid of the plastic in our daily lives. We began by going for the good old jute bag to carry groceries. Might sound old fashioned to many, but we know we are saving our environment and the effort is worth it. Instead of using plastic scrubbers, we have started using homemade scrubber made of coconut fibre (coir) to clean the dishes. We all like to keep our houses clean and perfect and seldom bother about what happens outside, However, if we pause and think of our environment as our home, and take small steps to prevent the exploitation, nature too will appreciate and cooperate, for a mother showers her love and blessing for children who love and care. For Pia, regular life is a thing of the past. She is now an Army wife. In the mysterious and grand world of Army wives, Pia learns that walking in high heels is okay as long as you don’t trip on combat boots. She learns that “civil” is also a noun, that JCO and GOC are very different, that snacks are shown and WTF is better explained as Whiskey Tango Foxtrot. Yes, it really is a new world! Let this quirky, hilarious story of the first year of Pia’s Army wife life show you that the spice to a soldier’s life is most definitely his better, very strong, extremely elegant, never-cussing, witty, warm and passionate half, his Army wife. What would be your reaction if you receive a parcel from Kargil? I came home one evening to find a somewhat concerned mom in law looking at a parcel on dining table. “Are you expecting a gift from some friend of yours in Army? I got this courier from Kargil and I didn’t open it wondering…” her unusual reaction somewhat concerned me, for I have no friends in the Army. The mystery was soon resolved when the wrapping gave way to a pretty book inside. 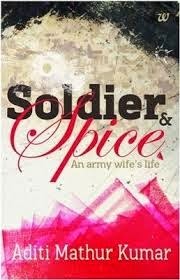 “Soldier and Spice..hmmm”, the title seemed promising and my mind began to come up with all sorts of preconceived notions I have about Fauji life. No matter how much glamorous the Army life looks from a distance, one only has to get closer to understand the difficulties an Army wife faces. For Pia too, the Army life is like a fantasy world of parties, flaunting designer dresses, making new friends and having someone to help you with housework, until she marries Arjun, a Captain in Indian Army. She sees a trailer of the movie, when she asks her husband the time on their drive to Pathankot “We’ll be there by eighteen hundred hours”, he says, much to her surprise. Once at the cantt it seems her dream life has come true. Dinners, ladies meet, welfare activities…she is excited about it all. But as the story unwraps, she figures out that Army life is not a bed of roses. Discipline, commitment, courage, leadership, perfection are some of the words we all prefer to confine to books. But her maiden year as the Army wife teaches Pia the true sense of these words, and transforms a carefree civilian into a responsible Army memsaab! Pia is not alone in this journey – various characters in the story help her in her metamorphosis in some way or the other. There is Arjun’s sahayak Ganga Bhaiyya, who transforms from the “one Pia is jealous of” to “the one who comes of help when she needs it the most”; Naina, Pia’s friend and confidante who gives her the first lessons on Do’s and Don’t’s; Mrs James, who keeps transforming from a friend to foe and back to a friend; Mrs Sengupta and Mrs Singh who are never short of their gossip supply; Mrs Nair, the queen bee who ends up having her way; Mrs Bhandari the second in command; a certain Mrs Nose hair and many others. Then there are these various rules of the game Pia learns throughout the book, many of which left me laughing out loud. I mean, snacks are served, not “shown?” Hehe…and so thinks Pia! Every page has this drawing of Army boots, perhaps a sign that to fit in Army boots, it requires a lot of hard work. Although her debut, Adti has got the flavor of the book right, for once you start the book, the story keeps you hooked on till you haven’t flipped the next page. I write this usually for thrillers, but sometimes simple stories weaved to perfection make an instant bond with readers. Strongly recommended from me whether you are well versed with the Army culture or not. For if you are not, the book will open you to a whole new world; and if you are, then the book will definitely remind you of some of your own experiences and smile. Aditi Mathur Kumar is an ex advertising girl, one upon a time blogger, a fanatical Army wife and a real life social person. With this debut, she has taken up writing for good. May we get many more interesting reads from her!